"No more sore shoulders and wrists or burnt fingers from pressing with a hair straightener." 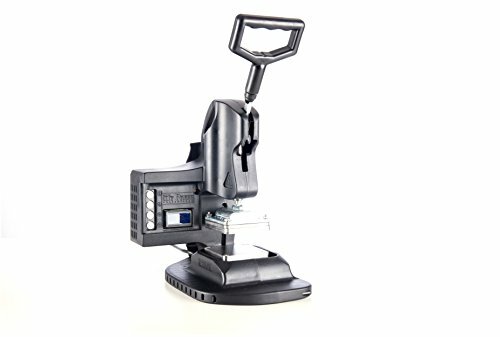 My Rosin Press is a portable, lightweight and personal rosin press designed and engineered from the ground up in Colorado. No need for a loud air compressor or bulky hand pump, My Rosin Press is silent and requires minimal effort to operate. My Rosin Press has an easy to read, operator-friendly LCD interface with a simple button layout. Easily set and adjust the heat to the stainless steel Axiom Plates with temperatures ranging from 100°F to 250°F (~38°C - 121°C). Our custom 3×3 stainless steel Axiom plates deliver even heat and pressure. My Rosin Press features a front facing count-up timer, which halts counting when opened, and resets from zero when closed. My Rosin Press allows you to efficiently monitor the process, and fine-tune adjustments to realize the best yield, or finest flavors from each press of your starting material. This proprietary functionality allows you to record and track the best starting material-specific results for later repetition. My Rosin Press evolved from a passion to provide everyone a superior, high-quality way to create their own solventless oil. Using the combination of heat, pressure, and time is absolutely one of the safest ways to produce highly desirable essential oils, and My Rosin Press is the industry standard for personal, small-batch application. Dimensions: height - 11.5" (closed) 16" (open), length - 10.5", width - 8.5"
6 Tons of Pressure. My Rosin Press operates with minimal manual force needed to Close and Lock the plates. Once the plates are locked, My Rosin Press will do all the hard work for you. Easy as 1,2,3...(1)Locked and Loaded (2)Sit back and Wait (3)Remove and Enjoy!cked, My Rosin Press will do all the hard work for you. Easy as 1,2,3...(1)Locked and Loaded (2)Sit back and Wait (3)Remove and Enjoy! Temp range: 100℉-250℉ (37°C -121°C ). Maximize your starting material's potential and desired outcomes. For each starting material, easily experiment and record your notes for future reference. This will allow you to consistently achieve what is most desirable for you, be it: heightened flavor, larger yield, or a careful balance of both. Front Facing Timer; Activated by Plates Open/Close. 0-9999 seconds. My Rosin Press features a front facing count-up timer, which halts counting when opened and resets from zero when closed again, allowing the operator to efficiently monitor the process, and fine-tune adjustments to realize best yield, or finest flavors. This proprietary functionality allows the operator to record and track the best starting material-specific results for later repetition. 3x3-inch Dual Heated Stainless Steel Axiom Plates. My Rosin Press Axiom Plates are evenly heated and measure the temperature from the plate surface; at contact point of your starting material. My Rosin Press is smaller than most home coffee machines. Its sleek design allows it to live comfortably in any environment. The power cord stores away cleanly on the back of the unit for easy and safe storage or transportation. No need for loud air compressors or bulky hand pumps, My Rosin Press operates silently and requires minimal effort to use. If you have any questions about this product by MyPress Solventless, contact us by completing and submitting the form below. If you are looking for a specif part number, please include it with your message.